This is a difficult but amazing experience. The tour is very well organized. We were picked up exactly on-time by our driver/guide. Is a long way from central Cuzco so use the time to rest for the actual tour. Breakfast was OK. The needed essentials for the trip. We came from a Caribbean Island, so we live next to sea level. So altitude took a toll on us but we were able to do it. This tour uses a relatively new route, which is shorter than the old one. You will have to walk about one or one and a half hour from the point in which you leave the car until the pick of the mountain. The walk is amazing. 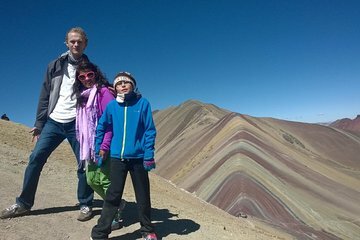 Great scenery of the iced mountains, and then, the rainbow mountain makes it even better. Since the route is shorter you can be back at Cuzco at a time still good to go out. Use clothing for cold weather and wind. Use horses if you feel you cannot walk the whole way. My wife and daughter used horses and they were glad they did. The only thing I would suggest to the tour people is to use a slightly bigger car or maybe a small SUV to take the parties to/from the tour. There were four of us and the car was a compact car in which we were slightly cramped. Other than that, this is an amazing experience. Jose was our guide and he was very friendly and attentive. He is passionate about the his job. Just know that the commute is long and the hike is tough. Be sure to bring warm jackets as the summit is very cold and windy. But it's an once in a life time experience! This tour is highly recommended! We took this tour a few days ago. It was so wonderful. Our guide Jose was wonderful! He was the best guide I've ever had on any tour anywhere in the world. He made sure that we made it to the top! I absolutely know that I would not have made it without Jose. This was one of the single greatest experiences I've ever had. I am truly grateful to Cusco Unique Experiences and particularly, to Jose, for this amazing day. Please listen to your guide so you can have an amazing experience as well! The tour guide, Jose, was fantastic and is highly recommended! We were able to reach the top quickly, giving us enough time to explore more areas. We trekked down to Puma Lagoon and saw chinchillas, an Andean eagle, and even a vicuna; apparently so rare it was a first for our guide! Use this tour. Excellent tour with exclusive and personal service from our guide Rolando! You need to endure the long day, from the early morning pickup from the hotel 03:45 and the 3 hours drive to the start of the tour. Overall, the tour was well worth it, and our guide provided excellent support for my 11 year old daughter. A word of advice, do not expect dining plates and crockery when being served your breakfast and lunch. It is served by the indigenous people in their traditional dwellings/restaurants, but excellent service provided. Having travelled and eaten with local Mayas in Mexico, this tour ranks equal for Peru and the Peruvian people. Thank you again Rolando for an excellent day.